It is commonly known that engines have extra solid particles left over from casting the engine which can clog your factory oil cooler, EGR cooler, and other critical engine components. Mishimoto has released a direct-fit coolant filter kit to help prevent your ride from being a victim of factory cooler clogs and failure. 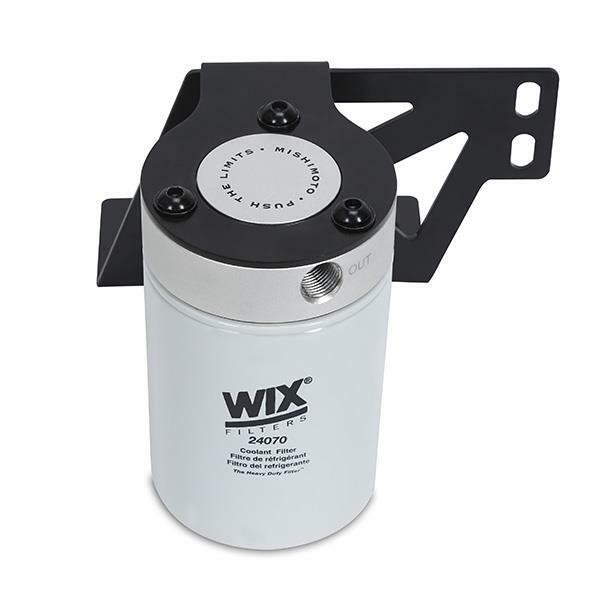 The application-specific mounting bracket mounts a precision CNC-machined 6061 aluminum filter mount and Wix coolant filter to the passenger side radiator support area, an ideal location for easily removing the filter. This coolant filtration system is routed in parallel with the flow path of your coolant system and allows a small amount of coolant to be filtered with each pass. The Mishimoto engineers also included two brass ball valves with this kit to help make changing the filters a clean process. The two silicone coolant hoses have been designed as once piece hoses to reduce any possibility of leaks and are offered in black, blue, or red to complement any engine bay.